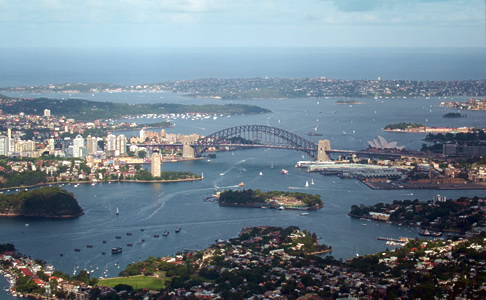 View of Sydney Harbour on the approach to Sydney Airport. I remember a quote by David Frost that went something along the lines of ‘the three best cities to fly into are New York, London, and Sydney’. I agree, but the best of these is certainly Sydney. The instantly recognisable composition of Opera House and Harbour Bridge cannot be beaten, and I always find myself unable to take in its full majesty. Indeed, I was surprised by just how much this city has a hold over me. I was giddy with excitement on my arrival, overtaken by the unmistakeable feeling of coming home—a strange emotion to have for a place I’d only visited once before. At the same time, there is nothing like arriving in a foreign city and being able to walk around without a map, familiar with the unfamiliar. 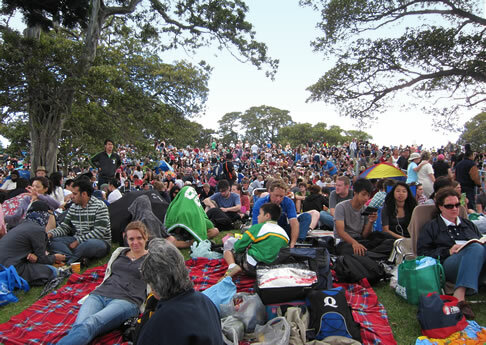 The main reason I returned was to see the famous New Year firework display over Sydney Harbour, but lack of planning was soon evident. I arrived at the Domain to gain entry into Mrs. Macquaries Point just after noon, but with twelve hours still to pass before midnight, I was met with a snaking queue that took over two hours to complete. This viewpoint had capacity for 20,000 people, yet the entire Harbour was home to an estimated 1.5 million spectators. The crowds patiently wait to see the firework display from Mrs. Macquaries Point. Not the most sociable of people, I eventually got talking to a family of Danes who were kind enough to watch over my small spot of turf whilst I went in search of refreshment, and laughed at a nearby Brit who was not only entertaining his friends but those sat around him also. Yet without any of my own friends, or a radio to hear the soundtrack that accompanied the display, it felt like an anti-climatic affair. Anger was the first emotion for many as this new decade dawned. The initial set of fireworks leapt into the air yet, unable to hear the accompanying soundtrack, they seemed to lack any co-ordination. Having seen the spectacle on the news so many times before, I quickly realised this was a spectacle designed for the medium of television, as from the ground much of the display was either hidden by smoke, people craning to take photos or overhanging trees. As I headed back to my apartment, Sydney seemed to have descended into a scene from 28 Days Later, drunks luring up to people to either wish them a happy new year or punch them in the face. This reaffirmed a long standing believe that the best way to spend the New Year is with friends, locked safely indoors, watching events unfold on the television, as they are intended. It’s all too easy to be pessimistic, but it’s worth noting that I did spend the first year of this new decade walking around Sydney Harbour, and spent the first evening relaxing on Manly beach. In that respect, I have little cause for complaint. After two and a half weeks exploring various cities, it was finally on to Melbourne, and the final stop on my short tour of Australasia.